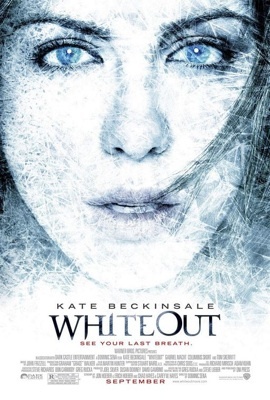 The movie adaptation of the graphic novel Whiteout opens tomorrow. Artist Steve Lieber, who illustrated the comic written by Greg Rucka, was kind enough to answer some questions about how the two different media versions of the story compare. When Whiteout was first being published, did you envision it in another medium as well? STEVE LIEBER: Back when I first read the comics script, Whiteout struck me as very likely to get other-media interest. It works as a movie, obviously. It could work as a prose novel — it would even work well on stage. It’s a really compelling story, and it has such an unusual setting. How did the movie deal come about? STEVE LIEBER: My understanding is that both Joel Silver and Dominic Sena had been interested in the GN since they first read it, back when it originally came out. After Reese Witherspoon’s option on it lapsed, Silver’s company contacted Greg Rucka’s representatives, and it moved very quickly from there. How much have you been involved in the filming? Did you get to visit the set or offer any input? STEVE LIEBER: I visited the set, but that was way, way too far into the production for me to be pulling out a pencil. The filmmakers had 200 pages of my artwork — something like 1500 panels — to comb through for visual ideas. For a movie this size, that was plenty. There’s going to be a feature on the dvd that does lots of panel to screen comparisons. Have you seen the final film? What did you think? STEVE LIEBER: I haven’t seen it yet. My first viewing is going to be at the red-carpet premiere in LA. What is the biggest thing you thought they got right in translating the graphic novel to film? STEVE LIEBER: Since I haven’t seen a final cut, that’s hard to say definitively, but I adore the look of the movie. The environments that Graham “Grace” Walker created are incredible. His envisioning of Amundsen-Scott South Pole station and the Russian base have to be seen to be believed. And what I’ve seen of the relationship between Carrie and the Doc has been perfect. Everything about them I tried to draw in the graphic novel was up there on the screen. What one thing would you have changed about the movie? What would you tell moviegoers to interest them in the graphic novel? STEVE LIEBER: Whiteout (the graphic novel) is a smart, atmospheric crime story. It’s gotten a ton of acclaim and the story means a lot to me and Greg. I put everything I had into drawing it, and I think it shows on every page. You can see for yourself by reading the entire first issue for free on my website. What’s currently on your plate in comics? STEVE LIEBER: UNDERGROUND: a thriller set in a Kentucky cave system, written by Jeff Parker, the writer behind great Marvel comics like Agents of Atlas and X-Men First Class, published by Image Comics. It’s fast-moving and tense — a conflict between a couple of park rangers and some locals spirals out of control, and what should’ve been an argument turns into a life-or-death chase through the dark. It’s a beautiful, creepy, claustrophobic environment, and the chemistry between our two park rangers is great. (One’s a gal, one’s a guy.) Parker’s the best new writer in comics and I’m having a blast drawing it. My thanks to Steve for his answers. I’m going to see the movie on Sunday, so I’ll be telling you what I thought then. I neglected to ask Steve about progress on the final Whiteout book: Originally called Thaw, the four-issue miniseries was planned to start in Fall 2007, but in December 2008, Rucka posted that the title would be Night, and it would be coming out around now. According to an FAQ on Lieber’s site, however, while one issue has been completed, “Greg has had to put the script for issue two on hold for a while.” In the meantime, everyone should be reading Underground!